MEET ME IN THE SQUARED CIRCLE. Showtime Championship Wrestling has gained major traction over the last year. Their next local event on May 19 benefits Special Olympics for the second year in a row. I was not allowed to watch professional wrestling growing up, so to view it I had to sneak a portable black-and-white TV into my room after my parents went to sleep. Many a Saturday night I did just that; secretly staying up to see larger-than-life characters face off on a tiny five-and-a-half-inch screen. In my 20s, though, I only checked in with wrestling intermittently – partly because I became too self-serious for my own good as a fledging hipster, partly because I didn’t have cable. Mostly the hipster thing. Just like that, Showtime went from organizing one show to putting on 12 events in two different states, and raising thousands of dollars for charities along the way. Here I am, now 31, and I’m as big of a wrestling fan as I ever was thanks to a recent realization that my arts and entertainment diet – y’know, gritty television dramas and Cormac McCarthy novels – has been severely lacking in an important category: fun. (Re)Enter wrestling – a totally unique type of live performance that blends athleticism, acrobatics, and stunt-work with a bunch of other things I love: story-telling, theater, improv, and stand-up comedy. It’s heavy on spectacle and pageantry, it’s not afraid to be silly, it’s exciting, funny, and completely its own weird, wonderful thing. It’s fun, dammit. It’s just a whole lot of fun! Hey, remember fun? The great thing about being a wrestling fan in the Chippewa Valley right now – whether you’re a lifelong enthusiast, recent convert, or someone who, like me, has rediscovered a lost passion – is that you don’t have to travel far to catch it live and in person (which, by the way, is a lot better than watching it on an itsy bitsy black-and-white screen). 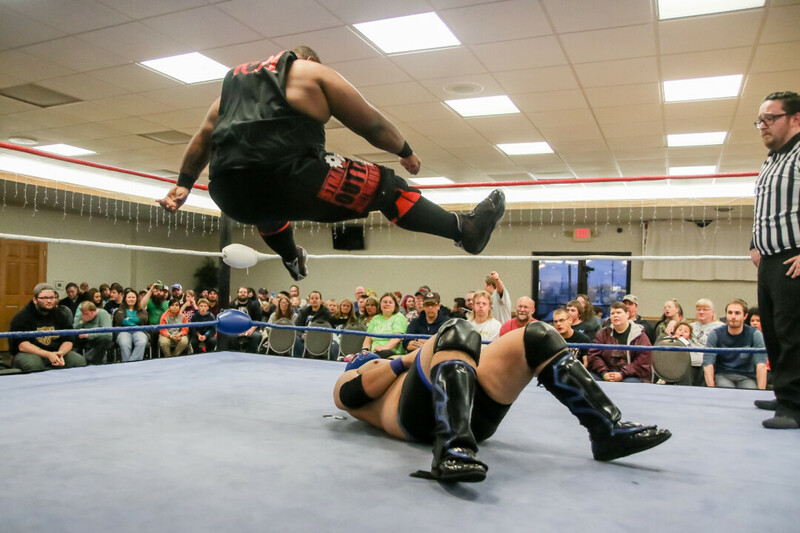 Live pro-wrestling has been happening in the area regularly over the past 12 months, and that’s all because of Showtime Championship Wrestling. Showtime, the Midwest’s newest independent wrestling promotion, got its start last year thanks to some locals from right here in Eau Claire. “Showtime started as just an idea for a one off-show to benefit Eau Claire Adult Special Olympics,” said Showtime producer and booker Josh Calisto. That initial idea belonged to Special Olympics coach Lyndon Cartman, who then approached his friend and fellow Eau Claire resident Troy Brostrom. Brostrom – a.k.a. “Red Lightning” – a 20-year veteran of the squared circle, had been looking for just such an opportunity to bring wrestling back to the Valley. After adding Calisto to their ranks, the three organizers started to make the Special Olympics benefit a reality. Things quickly took shape and on May 20,2017, the first (and what was supposed to be the only) Showtime show was held at the Eagles Club in Lake Hallie. The event was a big success that raised more than $2,000 for Special Olympics, and the Showtime crew was subsequently asked about returning for the Hallie Block Party to assist in raising money for the Veteran’s Unmet Needs Program. Showtime did that last September, and that same month also helped promote a benefit show at an Eagles Club in St. Paul. The success of the St. Paul event opened the door to Showtime having monthly dates there, and just like that, Showtime went from organizing one show to putting on 12 events in two different states, and raising thousands of dollars for charities along the way. Now with a full slate of events scheduled into 2019 and a roster of local, regional, and national wrestling talents, one thing is clear: Showtime is here to stay. Accomplishments such as these deserve to be celebrated, and on May 19, Showtime will do just that with a big one-year anniversary show. The event – once again benefitting Special Olympics – will bring their impressive inaugural year full circle at the Hallie Eagles Club. It will be triumphant, but also bittersweet. That’s because Lyndon Cartman, who lit the fuse that led to their quick success, passed away last month. Cartman – who was beloved by his family, friends, bandmates, Showtime collaborators, and the Special Olympians he coached – will be honored at the anniversary show with the introduction of the Lyndon Cartman Memorial Tournament, the winner of which will be crowned the first ever Showtime Heavyweight Champion. “The intention is to stay in business and have the Lyndon Cartman Memorial Tournament be a yearly event that hopefully will be something that wrestlers from all over the U.S. – maybe the world – strive to compete in,” said Calisto. Needless to say, this event is a significant one for Showtime. May 19 is the day, so make plans to come join this celebration of Showtime’s first year. In doing so, you’ll be helping raise money for Special Olympics and also be part of paying tribute to the memory of a good man who will be greatly missed. Oh, and there’s this one other big reason to go: You’ll have fun. Hey, remember fun?